Yes, please send me the following quantity of Graffiti. If mailing address is to CANADA, I'll pay C$16.95 per copy. If mailing address is to the USA, I'll pay US$14.95 per copy. If mailing address is OVERSEAS, I'll pay US$15.95 per copy. Arguably the best poetic graffiti around — filled with edginess, impulsive spontaneity, and the transcendent artist’s desire to leave a mark on life. 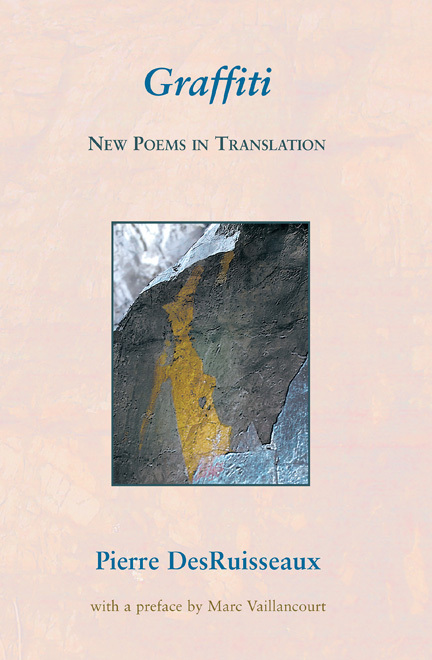 practises that ellipse of metaphor in which I like to see the primal symbol, polished by the poet to a glittering point of excellence.... Pierre DesRuisseauxs work abounds in such triumphs. Pierre DesRuisseaux, poet, editor, translator and authority on Quebec popular culture, is one of the most active proponents in the Quebec literary scene. Born in Sherbrooke, Quebec in 1945, he is the author of numerous volumes of poetry, non-fiction and fiction. His poetry collection Monème won the 1989 Governor-Generals Award. He is a frequent editorial and creative contributor to literary journals both inside and outside Quebec. He is also the author and researcher for many works devoted to current Quebec culture, including le Dictionnaire des expressions québécoises. List prices above do NOT include applicable taxes. Offer prices on the left DO!